Wear your aligners per your doctor’s instruction,s usually 20-22 hours per day. Make sure you have the proper aligner-the upper for your top teeth and the lower for your bottom teeth. Note : If you experience sharp pain or significant discomfort, discontinue use of the aligners and contact your doctor. Immediately rinse aligner with water, shake off excess water and store your aligners in the protective case provided with your started kit. Clean your aligners prior to each insertion. Use a soft bristle toothbrush with water and a small amount of toothpaste. You may find it easiest to clean the outside of your aligners by brushing them while they are still on your teeth, then remove your aligners to clean the inside surfaces. Note: Be sure to rinse each aligner thoroughly with water after each cleaning. We also recommend that you use the Invisalign aligner cleaning products once a week or as needed. Brush and floss your teeth after each meal or snack prior to re-inserting your aligners. If you don’t have access to your cleaning system or a toothbrush, you can simply rinse your mouth and then clean your aligners by holding them under warm running water. It’s not the best way to clean but it works in a pinch. Be sure to thoroughly clean your aligners at your earliest convenience. Two aligners cases are included in your starter kit, a blue case and a red (or orange) case. We recommend that you store your Invisalign aligners in a case when they are not in your month. This will help protect them, from loss and damage. Designate your blue aligner case for your “current stage”. Store the aligners you are currently using (e.g. stage #1) in this case. When it is time to switch up to the next stage (e.g. stage #2), transfer the previous aligners (e.g. stage #1) to the red (or orange) case. Always keep the most recently used aligners in this case. If your current aligners is lost or broken, your doctor may recommend that you temporarily go back on stage and use the aligners in the red (or orange) case while a replacement is being made. 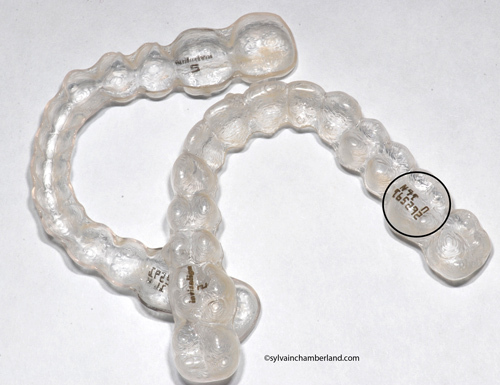 Note: Keep all of your older aligners in a clean plastic bag or as instructed by your doctor. Keep them out of reach of small children and pets. A: Most people experience tooth soreness for a few days after starting each new stage. This is normal. It Is a sign that the Invasilign aligners are working, moving your teeth to their final destination. This soreness should gradually go away a couple of days after inserting the new aligner in the series. If it doesn’t, promptly call your doctor. A: Like all arthodontic treatments, the aligners may temporarily affect your speech and you may have a slight lisp for a day or two. However, as your tongue gets used to having aligners in your mouth, any lisp or minor speech impediment caused by your aligner should disappear. A: Minor discrepancies between the new aligner and the current tooth position are normal, since the teeth need time to conform to the new aligner position. In the event of significant problems with aligner fit, inform your doctor. Q: Are these restrictions on what I can eat? A: In general, no. Unlike traditional orthodontics, you can usually eat and drink whatever you desire because you remove your aligners while eating. Thus, there is no need to restrict your consumption of any of your favorite foods and snacks, unless otherwise instructed by your doctor. 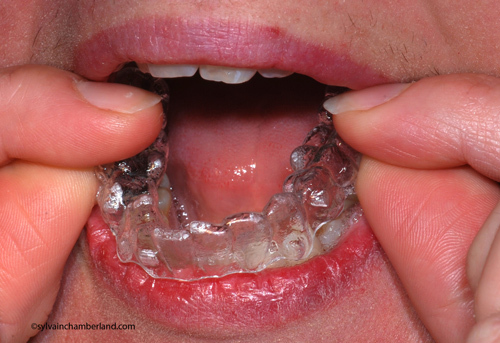 A: Except for cool water, we recommended that you do not drink while wearing the aligners. This is to avoid formation of cavities and stains or warping of the aligners with hot drink and hot water. A: NO. Gum will stick to the aligners. We recommend removing your aligners for all snacks and meals. A: We discourage tobacco use while wearing aligners because of the possibility of aligner discoloration. A: Depending on your specific treatment, some of the movements may require either “attachments” or “ridges” to help the aligner grips the teeth. These bumps or wells are where the aligner grips the attachment the doctor places on your teeth. The attachments are actually small pieces of composite the doctor affixes to your teeth that are then gripped by bumps on your aligners. The ridges are slim indentations in your aligners. Your doctor will use one or both of these features to attempt to achieve the desired movement. Q: What if I lose or break an Invisalign aligners? A: In the event that an aligner is lost or broken, you should immediately inform your doctor. Your doctor will probably tell you to start wearing your last set or next set of aligners immediately. He or she will possibly order you a new set of aligners to replace the ones you just lost, which should arrive in a few days. A: In the event that an attachment is lost or broken, you should immediately contact your doctor. Warning: In rare instances, some patients may be allergic to the plastic aligner material. In such cases, discontinue use and consult a health care professional immediately Align Technology must also be notified. Orthodontic appliances or parts thereof, may be accidentally swallowed or aspirated and may be harmful. May you continue using your invisalign liners while having a sore throat?